Science or commerce? Copy right or copywrong? Duane posted an abnormally interesting certificate which came from Lawrence Lessig's keynote talk to EDUCAUSE09. The video is here (I have not seen it as we only have slow intermittent Internet here on the Thai-Burma border). I posted a long comment on Duane's blog, but since I am unlikely to post anything else here in the next while, on holiday with intermittent Internet, I'll reproduce here in even more extended and focused form, as a post. Copyright, which seems to mean the right to forbid others to copy, may or may not be theft. Actually, of course it is NOT theft, producers of creative works have the right to obtain a reasonable (or at least today an unreasonable, if they are sufficiently famous) income from their work. But copyright certainly IS the antithesis of science, since any science worthy of the name is open to debate and criticism. There is a commercial form of education that exists to ration and control the supply of licenced practitioners of various professions - that sort must love copyright. Then there is education as the process of learning to share in the process of growing and nurturing knowledge - that sort detests copyright as its antihesis. Technology is another really interesting case, which Lessig (on this slide, as I have not seen the whole, having slow intermittent Internet here on the Thai-Burma border) does not mention. As for education, the question is: Is technology science or commerce? Now let's consider the case of theological study or education. Is copyright right or wrong? Is theology science (in this post I have tried consistently to use "science" in it's European sense of an open and criticisable body of knowledge) or commerce? There is a setting to compact space automatically. Then click the 'compact folders when it will save over _____ KB' checkbox. Adjust the numerical value as desired. The brilliance just got better, I may not have to remember to "compress" ever again. By the way, I am trying out BlipTV as a place to store the videos, I have uploaded some trials to The World of the Old Testament, of course the interviews with theology students and teachers in Sri Lanka will go on Wordpress, who have just upped the free storage to 3GB, what good timing! If someone were to give me US$299 (or whatever the Education price is - not displayed on the website) I'd love to use the full version! I wonder how well the two-way audio would work over dialup, let alone video, so for now this is a dream of the future for many of our students. This is Umesh from authorPOINT team, thank you for your comments on aP Lite and WiZiQ. You got that all correct but for one thing. You can actually upload aP Lite output to your own servers (manually ofcourse) and they would play fine as any other html page OR embed SWF tag depending upon which mode you are interested in and how much you can code at your end :). FAQ at http://www.authorgen.com/authorpoint-lite-free/faqs.aspx#6 has the details of possible distribution modes of the output. We did not include these within the software to keep the installer size as low as possible and to keep the UI easy enough for maximum possible range of users. You can write to me directly at umesh@authorgen.com if you feel like discussing this more, such discussions help us immensely to plan the product further. “Well, that’s when I banned computers from my classroom,” she said smugly. “That fixed that problem up right quick.”“It’s probably inconvenient for them to have to use pen and paper but it’s just so rude for them not to be focused on my lecture!”. If liberal education is going to make progress and be of any value in this culture, it has to embrace the way people actually learn and consume information today, not they way they did in the days of Socrates, or even our parents. Or even, truly, us.. They were five years old when Quentin Tarantino gave us Pulp Fiction. They’ve been using the internet since elementary school. They’ve never seen a floppy disk. They barely remember VHS tapes, and have never gotten tangled up in an overly long phone cord because they grew up with cordless phones. They’ve never recorded songs off the radio: they’ve always been able to download them. These are this year’s freshmen.” I’m sure that hearing this, many professors will balk and stammer, and many will think, “God, what do we have in common with these kids?”. But, we still expect students, old and young in the age of MSN and TXT to sit, often in ROWS, and look to the front, while someone "delivers information and ideas"!? I was seven when Star Wars came out. I've never had to be connected to another phone via the operator, and I WAS able to record songs from the radio (my parents couldn't at my age)! Yes, "we still expect students, old and young in the age of MSN and TXT to sit, often in ROWS, and look to the front, while someone "delivers information and ideas"... If the person being listened to knows what they're talking about and is open to sharing their perspective beyond the lecture script, there's value added! I'd be interested in an unpack of the statement, "If liberal education is going to make progress and be of any value in this culture, it has to embrace the way people actually learn and consume information today, not they way they did in the days of Socrates, or even our parents. Or even, truly, us." Education is not about 'consuming information', MSN or TXT. I think what is sorely needed is an honest critique of "the way people actually learn and consume information today", which tends to be seriously lacking. The reference to Socrates is a really interesting one, particularly as he of all philosophers was most interested in the sort of dialogue that many hold to be the way forward for education in these eTimes! Though, I am still in agreement with what I take to be the overall intent and tone. Even information delivery via lecture theatre can be ameliorated, but one talks to many is not a good way to deliver information, or even ideas. We should use it for what it can be good, to assist people to process, critique and understand the ideas and "information". After all is that not (again as you suggest) what Socrates did right? But the kind of class room in the video is not conducive to that sort of engagement, it tends towards the old information from the front copied, or heard, by the rows but sadly left largely unprocessed. Unless we do things in, with and around the class room that subvert its influence! Yes, I agree that we can and should be doing so much more as educators to teach well - and I agree that the lecture should be done well, and not be the sole part of an educational mix. You wrote, "one talks to many is not a good way to deliver information, or even ideas". How about "One writes to many?" This of course can be implemented in e-learning 1.0 as "one writes to many" in conversation. I applaud your last point - solid learning really does require process. But process without information is like oil without machinery; we need to take a holistic approach to teaching and learning. I will be over your way on Monday... see you then! A post on the always stimulating IFbook blog, about recording the writing process ("Poetry in Motion"), pointed me to the intriguing QuickMuse. The site is devoted to presenting poets writing poetry. Not videos of poets talking about writing poetry, but screen captures of the actual (almost physical) process of writing. A people with a moral vision for themselves and humanity emerged through the birth waters of the Sea of Reeds. This vision was created out of the dark night of slavery, from being crushed in the cruel womb of Egypt. They now march toward Mt. Sinai, to meet the Divine Presence that has called them into history. She writes - at least on this occasion, with a short time limit - by slapping the main ideas down fast, and then tinkering till it is "right". and then looking at some of the poems they link to, and then wondering, how would such a tool (if always available) impact writing - after all writing is as interesting as reading! One Laptop per Child: Unforseen consequences? According to the Reuters report, "Developing nations to test new $150 laptops" the One Laptop per Child project should start delivering the first few thousand innovative tough laptops to "to eight nations in February". This project is smart enough, new enough and visionary enough that anyone with a love of technology and half an imagination is bound to be excited by the possibilities. But recently I've begun to think of the possible unintended consequences. These first 2,500 machines will inevitably be concentrated in villages associated with prominent people. But what about the next million or six? If they too are concentrated in the hands of the villages, tribes, and language groups of the powerful will Western altruism in trying to bridge one "digital divide" widen another? Or will organisations like World Vision ensure that they also get in significant numbers to the least "advantaged"? merely be replaced by this (without the smiles)? Did you listen to this interview Kim Hill did a week or two back? 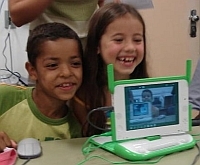 All about the OLPC project. Thanks for the link! Not only a fun interview, but listening gave me a bright idea, within a year or three these (multimedia) laptops will be in villages across the world. Many of the (grand)parents of these kids will be illiterate and/or in hard to reach places... what a great way to distribute Scripture in mp3 format. Let the Bible be heard in places print Bibles cannot reach! I've registered xobible.com and xobible.org already!